If you own a condominium apartment or Executive Condominium (EC) apartment in Singapore, you will be familiar with the term “Planter box”. This refers to a recessed area in the balcony that is meant for plants. Planter boxes or planters proliferated in the mid to late 2000s following a directive from the authorities to introduce more greenery to Singapore’s numerous high rise buildings and not have a cookie-cutter concrete jungle look. These planters could be rectangular-shaped, or L-shaped and can measure anything from 0.8m by 3.8m or even more. They are usually situated right at the perimeter opening of the balcony. While the original intention is great, this directive has resulted in many homeowners being saddled with planters (that they have paid for, by the way), and not knowing what to do with them. Recent condominium and ECs like The Palette, The Minton, Canopy (at Yishun) and Spottiswoode Residences (just to name a few), are property projects that have large balconies with numerous and sizeable planters. Given the size of the these planters, it is no wonder homeowners are eager to explore ideas to help them use these planters in ways that best suit their needs and lifestyles. We rounded up 7 ideas on what you can do with your balcony planter and discuss the pros and cons of each idea. You can of course choose to leave your balcony planter as it is. The main benefit of leaving it bare is that you do not have to spend any money or effort on it. Aesthetically, it is less than ideal as it remains a concrete hole. It may also pose a safety hazard as anyone in your family or your guests can fall in and cut themselves on the sharp edges of concrete or break something. This can be avoided by locking up the balcony and preventing anyone from going out there, but then, what a waste that would be. You would be prevented from spending time on your nice balcony, which is essentially a part of your house. See it as an extension of your living room or bedroom, and you will appreciate these other options to enhance your home. The first obvious use of the balcony planter would be to use it as it was intended, a planter. There are several benefits for this. Firstly, you help to green the façade of your building, and secondly, if the correct type of plants are used, they act as a screen for privacy and provides some respite from the strong sun. If you decide to use your balcony planter for plants, it is important to first determine the amount of sunlight that your balcony gets. You also need to ask yourself whether you have the inclination to water the plants daily (sometimes up to twice a day), fertilize and prune them periodically or you prefer plants that are really hardy and do not require much care. Do you prefer leafy plants or flowering plants or edible gardens? Share this information with the people at local plant nurseries are get them to recommend appropriate plants that would suit your needs and preferences. Then fill up the whole planter box with soil and plant away. If you have “green” fingers and love pottering around in the balcony with the plants, this would be a good option. Some of the drawbacks of using the balcony planter for plants are the water and time required to maintain the plants. Using tall plants provides privacy, but they will also block your view of the skyline outside. If you are the sort who likes to lean on the balcony ledge after a long day’s work with a glass of wine and gaze out into the night sky, this may not be the best option for your balcony. If you often travel, you may also need to make arrangements with your family or neighbours to drop by to water the plants. Flowering plants may also attract insects such as bees, so if you have young children at home, you may want to steer clear of flowering plants for the children’s safety. 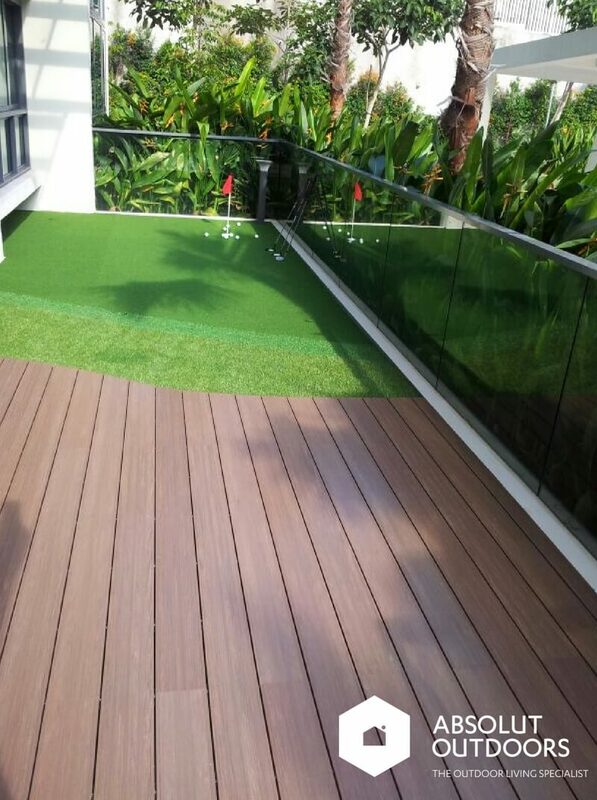 Whether you are a golf fanatic; or are training your kid to be the next Tiger Woods or just enjoy hitting some golf balls, a putting green right at your balcony may just be for you. The recessed planter makes it ideal for this purpose as the putting cup and putting strip can be hidden in the recessed area. This way, the planter box will be covered and levelled to be the same height as the rest of the balcony flooring. 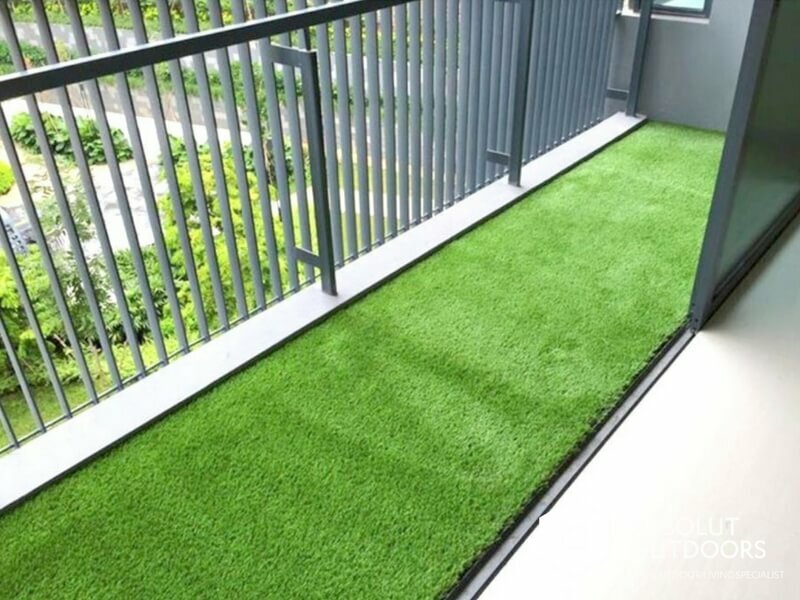 The balcony will be covered with artificial putting green grass that will mimic actual putting green surfaces so that you can practise your golf on a realistic surface. When not using your balcony for putting, you can cover up the golf cups (or just be careful) and use the balcony for alfresco dining or as the children’s play area. An extra benefit is that you get to green up your home with the putting green grass. This really helps to relax the mind. Some homeowners make use of the recessed planter boxes as a fish pond. You can even add a water feature at the pond and convert your balcony to a little Zen garden. A little pond with koi or any other fish swimming around can be a nice de-stress corner in your house. If you are a fengshui believer, do check if a pond or water feature at this part of the house will aid or hinder your luck. And if you have young children at home, we would not suggest using the balcony planter as a pond as it is a grave danger as they may lose their footing and fall inside the pond. In fact, if you have old folks at home, you may also want to avoid this option. If you travel, remember to get you family or neighbour to help feed the fish. All these add up to time, money, and effort. Fancy the Japanese style of seating at certain restaurants where your legs are dipping into the recessed area? You can do that with your balcony planter too. Line the sides and bottom of the planter box with nice outdoor fabric or artificial turf and sit at the edge of the balcony floor with your legs in the planter box if you want. We would not recommend decking the edges of the planter box as the wood edges may splinter and injure people. Using composite wood would prevent this from happening but it is also a hard surface whereas outdoors fabrics or artificial grass gives a softer feel. It is important not to use normal fabrics but outdoors fabrics for this as the balcony is exposed to the sun and normal fabrics are unable to withstand the weather. The last thing you want is a soggy and mouldy surface. If you decide to use your balcony planter as a recessed seating area, bear in mind that you still cannot do the lean on the balcony ledge with a glass of wine thing, and leaving such a big “lobang” or depression in your balcony could be potentially dangerous as anyone could forget that there is a big hole there and fall in. If you have young children at home, it is important to educate everyone, including any helpers, to keep the sliding doors leading to the balcony closed and locked to prevent any mishaps. You can install a cover for the planter box and use the planter box as a storage area. This cover can be made of wooden decking, or artificial turf on a drain cell base. 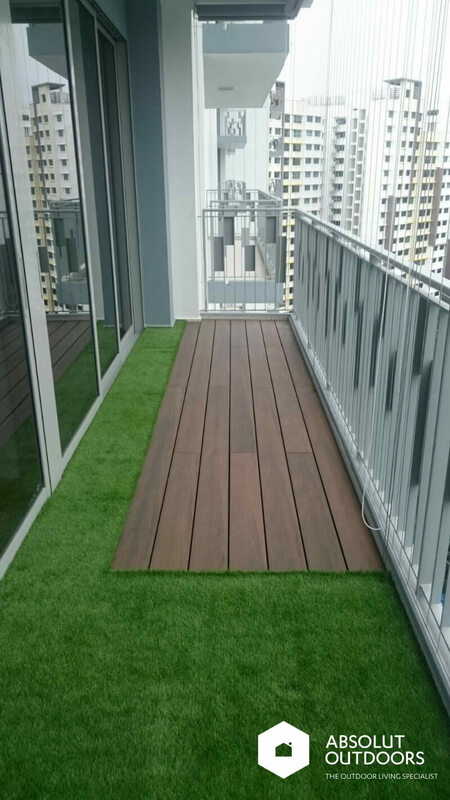 Wooden decking is heavier and if you intend to access the items inside, it may be better to use artificial turf for ease of access. As the balcony is still exposed to the elements, albeit partially, the items stored inside the planter box can still get damaged from the sun and rainwater. Ensure that items stored in the planter box “storeroom” are hardy, or are properly wrapped in canvas or stored in plastic boxes. If you decide to convert your planter box to a store area, make sure that the cover is sturdy and can withstand adults walking on it, as guests who visit will tend to walk out to the balcony to admire the scenery or chit-chat. Given the hidden dangers of a recessed planter box (if you do not intend to plant anything there), it would be safer to simply cover it up and flush the level with the rest of the balcony. The immediate benefit is that you add usable floor area to your home just like that. For some homes with multiple balconies, you could be adding up to 100 square feet of floor area! Given how starved of space we are in Singapore, this 100 square feet of space is indeed sizeable. With this option, you effectively increase the area of your home. Before covering up the planter box, most homeowners find it hard to place even the smallest set of outdoor furniture at the balcony. Once the balcony planters are covered up and levelled with the rest of the balcony, the area suddenly seems so much bigger and user-friendly. You can put in a small table and 2 seats and still have place for the kids to play with their messy sandboxes at the balcony. To get this safe, child and pet-friendly balcony, simply get a contractor who is familiar with outdoor renovation or outdoor flooring work to cover up the planter box and lay over with an appropriate flooring material such as natural wooden decking, composite wooden decking, or artificial turf. 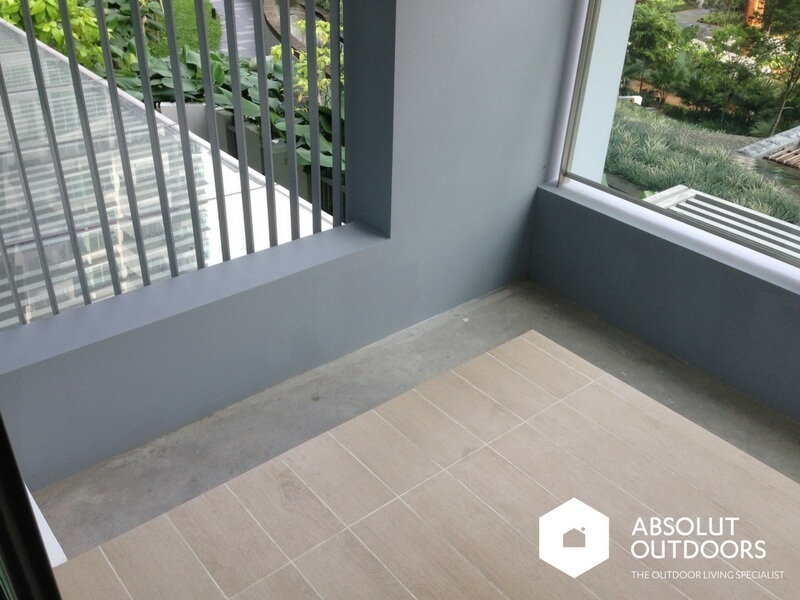 Each type of floor covering has its own pros and cons but the important point is that they are all easy-to-clean, weather-resistant and can withstand the sun and rain that the balcony is exposed to. Ultimately, the type of flooring that you choose would depend on your personal preference and budget. 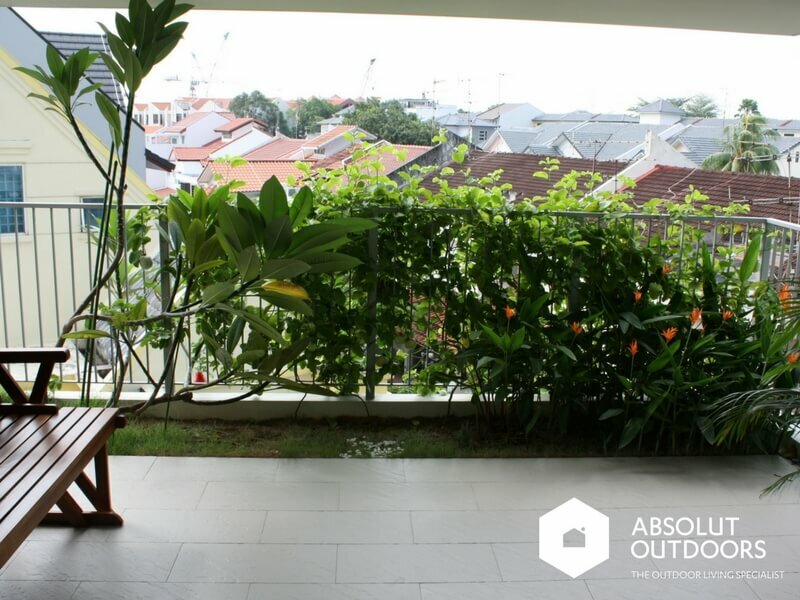 Do let us know in the comments in you have other ideas on what to do with balcony planters in Singapore. 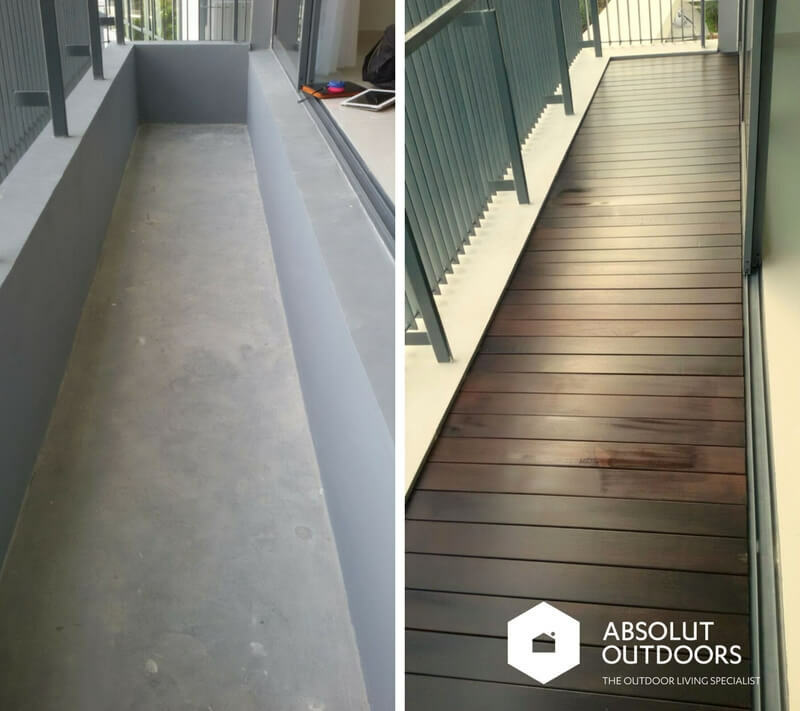 Also, join us in our next blog article where we discuss the outdoor flooring materials commonly used to cover balcony planters.